This page belongs to you. Please review and update your page details and privacy settings. Sightseeing tours of London in a London taxi. Tour themes include: London Highlights, London Rock'n Roll, London Horror + more Lots of stops and lots of photo opps. Qualified London tour guide & licensed London cabbie. Sightseeing tours of London in a London taxi. Lots of stops and lots of photo opps. 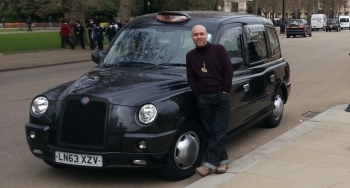 Qualified London tour guide & licensed London cabbie.